Congress leader and former Finance Minister P. Chidambaram on Friday said that Prime Minister Narendra Modi-led BJP government is greedy and wants to take away the central bank's reserves. "This government is greedy. 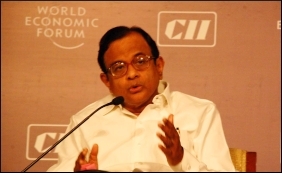 No government in the past has asked for the reserve with the Reserve Bank of India," said Chidambaram, who was in Guwahati to hold consultations for preparation of the party's manifesto for the 2019 Lok Sabha polls. He said that the RBI is not a limited company. "The RBI has a board of directors, but that cannot be compared with any private or public company. It is the central bank. The BJP government is trying to see the RBI as a limited company. They hardly have the understanding of the central Banks's role and function," he said. Chidambaram said that the Centre was eyeing the RBI's reserves, for it did not get anything out of demonetisation as most of the money came back to the banks. Asked about the RBI's board meeting scheduled for November 19, he said that even if the RBI Governor (Urjit Patel) resigns or complies with the government order of giving money from the reserves, the result will be catastrophic, and even worse than demonetisation. "My information says that the government may force to pass a resolution at the RBI board meeting to transfer a large sum of money from the reserves. Two scenarios can emerge if such a situation happens. Either the RBI gives in or the Governor resigns. Both the situations will be a disaster and will have catastrophic impact on the country's economy," he warned. "The Congress party believes that the RBI has the mandate to maintain monetary stability and nothing should be done to impair its ability to do so. The immediate goal of the government is to lay its hands on the reserves of the RBI and appropriate a sum of at least one lakh crore to meet its fiscal deficit target and to increase spending in an election year," he added. Earlier on Friday, the government dismissed reports that it had sought Rs 3.6 lakh crore from the RBI reserves. Economic Affairs Secretary Subhash Chandra Garg said that there was no such proposal and that the country's fiscal deficit target was on track.